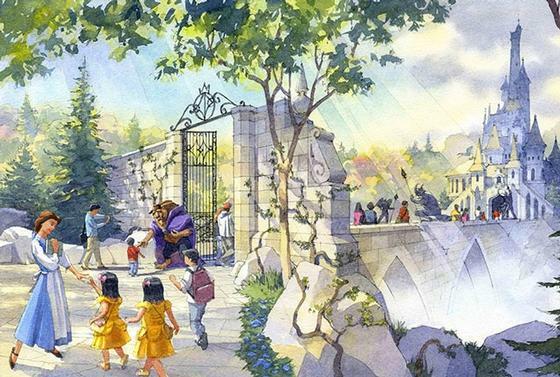 April 28, 2015, 9:26 AM · The Tokyo Disney Resort has released new details, including concept art, for the multi-billion-dollar expansion it announced last year. The expansion will including a new Frozen-themed "Nordic" port of Arendelle in Tokyo DisneySea, located between the existing Lost River Delta and Port Discovery lands. All concept art courtesy Oriental Land Co. 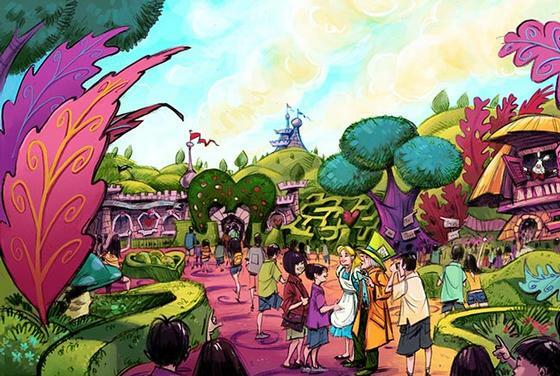 In addition, Oriental Land Company, the owner of the Tokyo Disney Resort, announced that the planned expansion of Fantasyland in Tokyo Disneyland will feature new mini-lands themed to Beauty and the Beast and Alice in Wonderland. Although Tokyo Disney is promising original attractions and restaurants in these new developments, there are some similarities to existing and upcoming Disney theme park attractions elsewhere. Walt Disney World is currently converting the old "Maelstrom" ride in the Norway pavilion at Epcot into a Frozen-themed ride. The concept art for Tokyo's Nordic port evokes some of the details found in Epcot's Norway pavilion, including the Stave Church that can be seen at the bottom of the image. If you're looking for additional similarities with existing Disney attractions, Tokyo's "Beauty and the Beast" concept looks like a plussed-version of the entrance to the Be Our Guest restaurant at Walt Disney World's Magic Kingdom, with a direct entrance to the Beast's Castle, rather than leaving that castle as a forced-perspective decoration on the hill above. Tokyo's Alice in Wonderland reminds one of Alice's Curious Labyrinth at Disneyland Paris, as well. 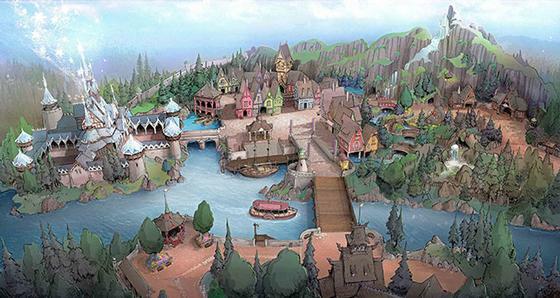 The new developments at Tokyo Disney are slated for a 2017 debut. April 28, 2015 at 10:08 AM · It's clear the powers at WDW don't care or give a crap about their customers, unlike the wonderfull oriental land corporation. April 28, 2015 at 10:30 AM · The rich get richer! Congratulations to Tokyo Disney Resort for three fantastic looking additions-LUCKY! And while looking at the original artwork with the initial announcement, there is still plenty of room in their Fantasyland expansion for more that has been revealed yet. We need MORE, OLC! April 28, 2015 at 10:45 AM · Wait a minute. Expected to debut in 2017? 2017 for a major Fantasyland expansion AND a brand new land at TDS? ABSOLUTELY AMAZING! April 28, 2015 at 10:47 AM · They are getting a proper Frozen with Arendelle. Hurray. I hope the Epcot Maelstrom makeover is more than a cheap turnover. April 28, 2015 at 12:11 PM · This is what we should be getting instead of the Maelstrom replacement, but WDW management doesn't seem to really care about WOWing us anymore (or at least WOWing us on a consistent, timely basis). Why invest billions in a new FROZEN land (one which wouldn't destroy the thematic coherence of World Showcase) when they can spend $75(ish) million on a quick, no-creativity-required reskinning and the people will come anyway? I would hope Disney has some big aces up the sleeve for D23 with respect to the Orlando parks, because if whatever they announce is perceived to be lackluster (or if there's no announcement of significance at all), it won't look too good from a PR standpoint, and it would further the perception that WDW's braintrust is - for lack of better words - cheap and indecisive. April 28, 2015 at 12:56 PM · So jealous! April 28, 2015 at 1:04 PM · Another reason to go. I was looking and the park tickets aren't bad but the flight and stay make it a dream still and not a reality. April 28, 2015 at 2:01 PM · And the hate just keeps on coming. April 28, 2015 at 2:07 PM · Why should Disney invest in WDW as it is already tops in theme park attendance worldwide? The foreign markets need to reach WDW's attendence before billions can be justified for WDW. The Orlando market is saturated as is with very little room for growth, right? How many more people can WDW and Orlando accommodate in peak season? April 28, 2015 at 3:32 PM · I was kind of thinking that a proper Arendelle would have been a great addition to the Magaic Kingdom where the Tomorrowland speedway sits. It could even go beyond the berm as needed. Yes the Magic kingdom just had investment but I think it makes more sense than Epcot. Luckly Tokyo getting all these great additions. April 28, 2015 at 4:38 PM · Glad Tokyo is actually getting Beast's castle vs Beast's dollhouse. That's an instance where removing it would actually make more sense. And while I will miss Maelstrom greatly, I hold hope for a great Frozen attraction. Fingers crossed. April 29, 2015 at 5:32 PM · Disney should seriously consider selling a portion of the U.S parks and resorts, similar to what they have done with Disneyland Paris. The downside would be that Disney no longer makes all the profits, but it also would mean Disney wouldn't spent all the investment either. If Disney sold 30% to another company, they would retain control and a majority of the profits, but would gain a new financial partner. Theme parks are expensive and that's why Disney has relied on other companies outside of the U.S. Disneyland wouldn't have been built without the deal with ABC. Disney was able to do accomplish more by the selling a portion of the park to them, and the same thing can happen today if Disney sold stake of their parks,especially DisneyWorld.